But getting bigger is what’s supposed to happen. Baby’s gotta have room to grow right? 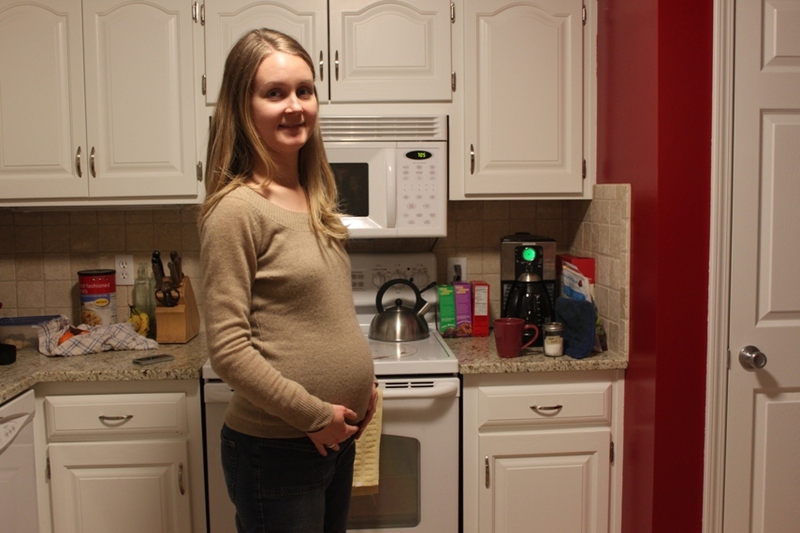 Everything is going very smoothly with my pregnancy (knock on wood). Other than nausea in the first trimester, I really haven’t had much to complain about. I’m no longer running, which is sad. But it was giving me some back pain and was starting to get uncomfortable, so I threw in the towel. Even walking on the treadmill gives me a bit of back pain, so I’ve been doing the elliptical. My body seems to like that a lot better. One thing I have been working on lately is the baby registry. My good friend Kelly was kind enough to accompany me to the baby store and help me pick out the things we will need for the baby. I still need to research a few big items, but at least I have most of the small stuff picked out. What are some baby things you can not or were not able to live without that I should definitely include on my registry? What are some baby things that are completely useless or pointless that I definitely should not include on my registry? Can’t live without: a good swaddling blanket (snag one or two from the hospital), TONS of burp cloths, sling (LOVED this with M), tons of socks (find some that don’t fall off, then let me know what they are! ), clock (to know how long they feed, what time they wake, etc. ), Bumpkins bibs were our favorite when they were eating solid foods, & something soothing – whether it be a swing, bouncy, etc. They won’t like everything, but something will be necessary!!! lots of newborn clothes/diapers (they grow SOOOO fast – 0-3 month will be big, but they will survive for a few days until they pack on the pounds – side note: N did require some preemie clothes @ first), wipes warmer, bottle warmer, sanitizing machine, diaper pail, stuffed animals/blankets/toys (people will buy TONS of this for you). You look so cute! I love the bump and don’t worry, it gets WAY huger! The one thing that I wish we would have splurged on and didn’t was a video monitor. Even though the kids are 3 1/2 and 1 1/2 I would still like one… I thought it was a little overkill at first, but ultimately I think it’s just helpful to “see” what they are doing rather than guessing and going in to check on them. It always seems like when I check on them it causes more issues, so the video monitor would have been nice! Your little baby bump is SO cute!! And yes, it will get larger…much larger! Your perspective on huge will change dramatically come week 40. ha ha! I already gave you my earful on the baby registry items, but feel free to email any other questions you may have! My children are now 7 and 9 but I can still remember things that I could not have lived without. Here is my list. – This item is a must have but you already have it. It is the hand held mixer, great to make baby food and then put them in ice cube trays, after they freeze you pop them out and save in a ziplock bag. When it was time to make baby food I would just add one cube of my different kinds of veggies, some salt and garlic and voila! – I can’t remember the name of it, but they are like sleepers but with no legs. It looks like a long dress with a elastic on the bottom. It was handy for nightime diaper change, just lift up, change and put back down again. -Someone mentioned socks…that is true. The best ones I got it was the cheapest they had on Target, it came a bag with a million of them. – Play n’ Pen -> Must must have, put in the trank of the car and take to friends house, park etc. – Light weight stroller, bulky ones are a real hassle and most of the time the baby want to be held anyway. I got a peg-perego that worked fine until my youngest was 3,5. – Baby safety stuff for corners, doors and drawers. I know you will not need it right way, but it is something that you can not live without. Check the website onestepahead.com they have great things. My favorite was this fiberglass thing (sorry, i am brazilian and don’t know all the words) that i put on the edge of my stove, so when the baby was clung to my leg I had not to worry about hot food splashing on him. This is definitely something important for someone that likes to cook.